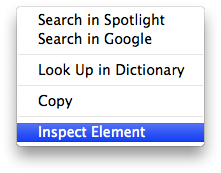 A New Mac Tip Every Day: "Inspect Element" in Safari! I talked about the "Web Inspector" in a previous tip. It applies specifically to Safari. What is really cool is the "Inspect Element" feature. You can access the Inspect Element option by right-clicking on anything on a website in Safari. What is great is it loads the web inspector at exactly the right place within the code. This is one of my favorite features of Safari. I learned so much about CSS and HTML this way. The background color in Preview! Running out of space with Handbrake!